Are Not What You Think! When I first started working with students on how to write college applications essays about eight years ago now, I put together a list of Do’s and Don’ts about picking topics. It was based on the idea that college admissions officers were seeing many of the same topics, or sensational or ill-suited topics that were not handled well. And that those were the topics you should avoid at all cost. But over the years, I realized there was no such thing as a bad topic. What matters about an essay topic is what the student had to say about it. In fact, with a little help, many of my students wrote the best essays about topics on the original “don’t” list: death, divorce, sports, mission trips, illness, you name it. Here’s a list of topic tips that tries to help you see the difference so that you can find a hot topic, and make sure it will help you write an original essay and stand out from the competition. Spend time brainstorming a killer topic before you even think of starting to write your essay. Finding a great topic, and then focusing it down into an even better one, is THE MOST IMPORTANT part of writing an engaging, effective and memorable essay. Do This: Look for a topic that is unique and specific. Find one that will help you tell your target schools something they wouldn’t learn about you from other parts of your application. If it’s something they would never expect about you, all the better. If you do write about an overdone or potentially cliche topic, make sure to find something unique or unexpected within that topic to focus on. Do This: Look for a topic that includes “a time” you were humbled in some way: You messed up, something went sideways on you, you didn’t reach a goal, you were a flop, you felt embarrassed about something, you admit to a mistake, etc. The Common Application prompts number 2 and 3 are the best ones to set you up to write about some type of problem you faced, which will allow you to share a time you were at some type of low point. Readers can relate and connect with you best when you open up and are vulnerable. Not That: Don’t write about your most impressive accomplishment(s). It’s very difficult to write about a personal victory or achievement and still come across as relatable and likable. Maybe you are “all that,” but it’s best to first share “a time” that helped you get there, and these usually involve some type of problem (challenge, obstacle, mistake, change, etc.). We all relate better to the struggle than the victory. It’s way more interesting. Do This: Look for a topic that is everyday. These are called “mundane” topics and they often result in the best essays. Not That: Don’t write an essay that tries to work in as many of your achievements, talents and skills into one essay. Examples: making the winning shot in state championship, earning top place at the science fair, starring in the school musical, placing first in a state chess tournament, etc. It’s way more interesting when you lose or fail! Do This: Find a topic and then focus it down into something more specific. Example: If you want to write about your passion for rock climbing, think about “a time” something happened to you while rock climbing. If you want to write about your experience working with special needs kids, think of “a time” something happened while you were working with one of them. Not That: Don’t write about how much you love rock climbing and tell the reader all about how you got involved, how you got really good at it and how much you love it. Too general and boring to read about. Don’t write about how you started working with special needs kids, and how much you loved them and how you learned to be compassionate and giving. Again, too general and boring to read about. Think of something specific that happened and write about that! Do This: Find a topic that will allow you to reveal something about yourself. The best essays are highly personal. Start by thinking of one of your core or defining qualities, and showcase that in your essay by sharing “a time” you either developed or demonstrated that quality or had it tested in some way. Make sure to open up yourself and share how you felt and what you thought. Not That: Write about something or someone but try to say to much about it or them, and not enough about yourself. For example, if you write about your defining quality of leadership, and only write in general terms about what you think a leader is and all the ways you were a leader. Instead, focus on “a time” you were a leader (Even better: how you failed one time at being a leader!) and how it made you feel and what you learned about yourself in the process. Another example is if you write about an incident that involved your relationship with your grandmother or a teacher, make sure most of the essay is about you—what you did, what you felt, and what you learned. 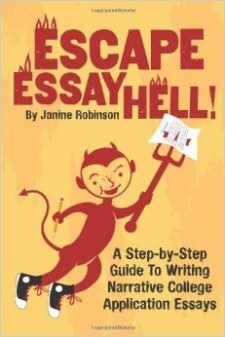 Want some more ideas on The Secret to a Killer College Application Essay or my Top 10 Tips? Keep reading and I think you will learn to figure out which of your topic ideas will make the best college application essays!